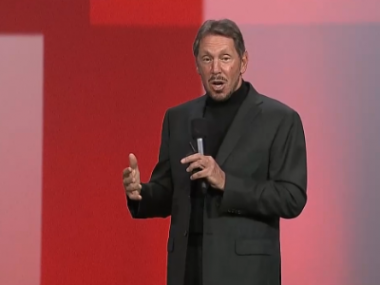 Oracle CEO Larry Ellison said he came to talk about cloud computing and he certainly delivered. In an hour-long keynote address from the Oracle OpenWorld Conference in San Francisco, Ellison announced four key initiatives bolstering the company’s bona fides in the business of offering computing resources as a pay-as-you-go subscription, but also lobbed some criticism at rivals like Salesforce.com and SAP in the process. Ellison disclosed four new Oracle products and services, including a new version of its database software dubbed 12c — the C is for “cloud” — that he said is tuned for the multi-tenant environments common in the cloud computing world, where software runs not only across several machines, but different physical locations. These “in-memory” systems also use strong compression technology to make the database smaller and thus allow it to run faster, but also cheaper. “Some applications will require a huge amount of capacity, and in some cases you can buy a much smaller machine,” Ellison said. Ellison also launched a few jabs, reminding the audience that the first cloud computing company was Netsuite, a cloud-software company in which Ellison is himself a key investor, and that it first launched in 1998. Salesforce.com, run by former Ellison protege Marc Benioff, the largest supplier of cloud-based software, was launched in 1999. Ellison also compared cloud computing to the century-old business model of selling electric power as a service. “It’s a good idea, but it is an old idea,” he said. “The utility model has been with us 100 years or more.” He also said that Oracle’s new hardware is faster than hardware from the likes of IBM and SAP. The disclosures from Oracle came as The Wall Street Journal reported that the company is close to announcing a deal with the Finnish wireless phone company Nokia under which it would license mapping and location data for use alongside its database software. Ellison also said it is working with the Japanese computing company Fujitsu on a new generation of SPARC chips that will go into a new servers. Oracle took over ownership of the SPARC chip architecture when it acquired Sun Microsystems in 2010.